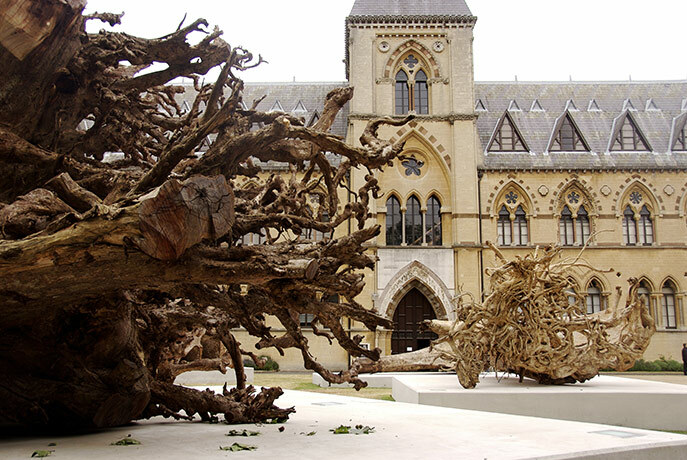 Angela Palmer’s Ghost Forest, Pitt Rivers Museum, Oxford. We were all fed up of work and responsibility this evening and went to play. We first walked about the Angela Palmer’s Ghost Forest installation near the Pitt Rivers Museum, massive monolithic, eerily beautiful trunks of trees logged in rain forests. Interestingly, Angela Palmer wrote that Anthony Gormley said that it couldn’t be done. It was impossible. That spurred her on. Good for her! Never believe that anything is impossible. Nothing is impossible with God. Or man.!! We then went on a long walk by the Oxford Canal, a quintessential Oxford walk, beautiful, and tranquil, with baby moorhens and ducklings, walking until 9 p.m. I think I would like to rent a houseboat at some point and glide on rivers!! Ghost-forest, Pitt Rivers Museum, Oxford. Isn’t this interlinked web of roots beautiful?